Our last issue gave us a “Secret Wars II” showdown between Phoenix and the Beyonder! While not a huge fan of cosmic-type Marvel stories (a damn shame, innit, what with the recent announcement that they’ll be revisiting Secret Wars next year), I still counted it an overall win for Claremont because it told a good story about Rachel Summers dealing with her newfound powers–not only the mantle of Phoenix, but a measure of the Beyonder’s own strength–in a manner worthy of an X-Man; namely by not scragging the Beyonder when she very well could have, and planned to. This week…well, I was as surprised as you may be, since we’ve reached the point where I stopped reading ahead when I started writing this column. The very next issue is another Secret Wars tie-in, featuring the Beyonder and Rachel on the cover, looking very much like they haven’t squashed their beef. The first five pages of the issue, penned by Chris Claremont with art by John Romita, Jr., are taken up with Rogue narrating her backstory, presumably for the benefit of those new readers picking up the issue because they’re following the Secret Wars II crossover. Die-hard X-Heads won’t need this, but I don’t mind the filler because, well, last issue stood well as a single-issue, editorial-mandated tie-in that still did a decent job. I’m not really all that excited about undoing that by getting into the Phoenix/Beyonder thing all over again. Aw, honey…I want to scream and throw myself in front of a truck, too! We then cut to present-time Rogue, having finished her maudlin trip down memory lane, descending from the sky into the backyard of former Spider-Woman turned private investigator Jessica Drew–they’re still in San Francisco, where the Beyonder left them last issue. She sees Shadowcat, meditating in the dark, dressed in a Japanese kimono, and stops by to say hello. Kitty’s not doing all that well. She pulls back the robe to reveal half her upper body covered in her friend Illyana’s (Colossus’ sister, the New Mutant called Magik) sorcerous armor (TL;DR Magik was raised in Limbo, basically Marvel Hell, as a child and learned dark sorcery in addition to her teleportation power). She then pulls Magik’s Soulsword, a mystical weapon bonded to Illyana, out of thin air. Rogue is taken aback, not only because Shadowcat shouldn’t be able to do those things, but because she doesn’t even remember who the hell Illyana is. Rachel steps out of the shadows, and Kitty fills her in on recent events–the Beyonder has destroyed the New Mutants, including Illyana (in New Mutants #37, another Secret Wars tie-in issue). Rachel reveals that she still has the Beyonder’s power, granted her by him last issue, and that she’s still willing to use it to destroy him. Only, as Kitty suggests, he could take the power back as soon as she confronts him. Rachel then declares that she’ll destroy the entire universe to get rid of the Beyonder, but that she’ll need the X-Men’s spirits, tied with her own, to accomplish the feat. Rogue, Kitty and Jessica all rapidly agree to Rachel taking their spirits into her own. Phoenix then helps herself to a sleeping Colossus, Wolverine and Magneto and when Ororo, awake in her bed, confronts her, she takes her essence by force. At this point, I’m truly “reading, so you don’t have to.” I totally understand the concept of editorial mandate, and absolve Chris Claremont 100%, but this is a poo-poo platter, and I don’t mean Chinese food. Since her introduction, 80s Rachel has sort of become an accepted member of the X-Men “behind the scenes;” none of the in-depth exploration and mistrust that happened with characters like Cable and Bishop in the 90s, when they arrived from their timelines. She’s gotten her character development in bits and pieces at this point and, not to beat a dead horse to death, but some of that occurred in the last issue. This issue is like, eight steps back. She stole her friends’ life essences, with the intent of sacrificing them for good to kill the universe. This isn’t like Rogue sampling someone’s powers while they’re asleep so she can beat a Sentinel or something. “holy crap!” type comments from Colossus and Magneto before Storm starts tearing into Rachel about the choice she’s taken from the others and how she’s just like the Beyonder if she takes the type of action she is. A couple pages of decent Romita art and philosophical monologuing later, Rachel opts to return everyone to Jessica’s home and their own bodies and declares herself a failure for choosing not to end the universe. Then…the Beyonder shows up and basically tells the X-Men to fight or he’ll terminate them on the spot. Logan–and Kitty, God love her–get in the Beyonder’s face about how unfair his treatment of humanity is, and how immature he is. It’s interesting to note that, when Kitty steps up, Magik’s armor returns in place of the sleepwear she had on initially upon her return to Jessica’s lawn. 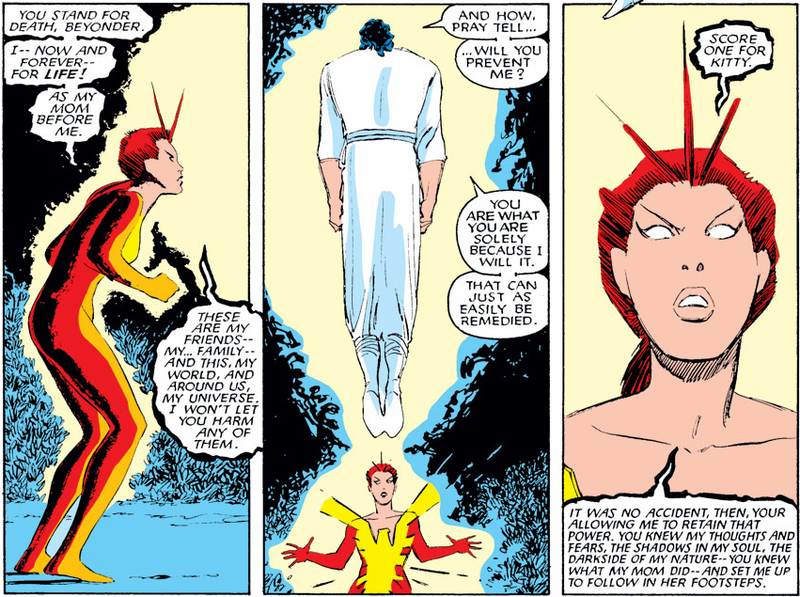 This is the Beyonder, though, and the only person he really takes seriously is Rachel, who, with the Phoenix Force, is actually “worth his notice.” The lightbulb comes on in her head and she realizes the Beyonder wanted her to destroy the universe, because it wouldn’t have killed him, but would have instead let him recreate the universe the way he wanted it to be. He asks Rachel for his power back, and she gives it to him–along with the Phoenix Force. It overloads him momentarily, but the breadth of the Phoenix’s experiences opens his eyes to what humanity really is, and he decides to part ways with the X-Men. Next Issue: Remember how I noticed Kurt’s conspicuous absence? He was up to something, after all–and thank Bob, it’s not Secret Wars-related! Last week’s installment showed Magneto being acquitted of his past crimes, not just by a world court, but also by his actions against Fenris, the children of Hydra leader Baron von Strucker–and his inheritance of Charles’ dream from the Professor himself, just before Xavier was whisked away by the Starjammers to be healed of the injuries he’d been suffering from for nearly the last year’s worth of the comic. 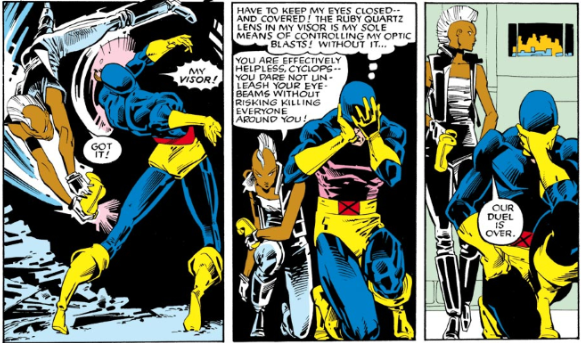 The past few issues also set up the return of both Cyclops and Storm. In the absence of the team’s traditional leaders, both Nightcrawler and Shadowcat have stepped up, but what’s going to happen now that Scott and Ororo are back, both accustomed to calling the plays? The issue, written by Claremont with pencils from Rick Leonardi, opens on a happier note–a full splash page of the X-Men celebrating the arrival of young Nathan Christopher Charles Summers into the world. Cyclops and Maddie’s son, of course, is known to long-time X-Men fans as the man called Cable (though he doesn’t make his adult appearance until over four issues later, in New Mutants #87). It might be worth noting that the only two characters without looks of joy on their faces are Scott, the boy’s father, and Rachel, Scott and Jean’s daughter from an alternate reality. Rachel is understandable, to me at least; in her world, her mother was still alive and in this world, she isn’t and her father has moved on. But Cyclops…well, Cyclops is a jerk around this time period of X-Comics, rivalled only by his actions during AvX, which arguably weren’t completely his own. Stay cool, Kitty–now would be a bad time to phase. 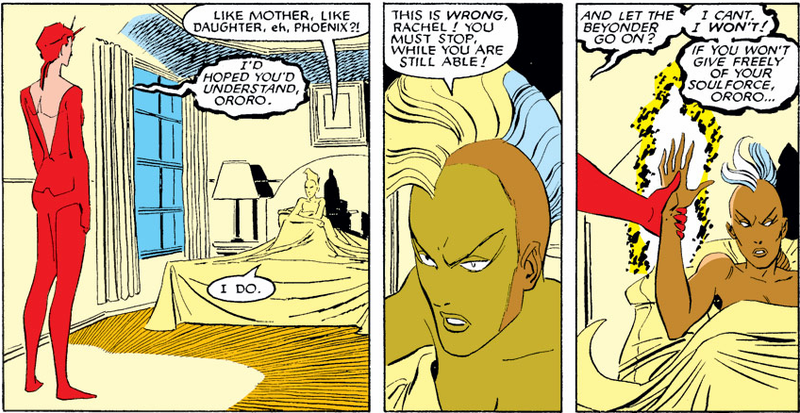 In fact, Madelyne pulls Ororo aside to discuss just that, though in broader terms. They discuss the Professor’s departure, Magneto’s assumption of command, and Madelyne’s concern over Scott’s return to the X-Men, where we discover that not only did Scott leave his pregnant wife alone to rush back to the X-Men, but that the whole rest of the team had called to check on her after Nathan’s birth, except for Scott himself. In the end, it’s Rachel who adjusts to this new situation better than her father, cradling the brother she never had in her reality and promising that he’d never see anything like the dark future she’d come from. Of course, taken with what we know of Cable in the X-Comics to come, this is ironic as hell, but even still, Rachel’s the one who becomes Mother Askani in the future and pulls Nathan forward in time to cure him of Apocalypse’s virus. It’s plain throughout their relationship, across time, that Rachel takes being Nate’s big sister seriously, and this is where it all begins. We cut to the Starjammer, across the galaxy and in a fight with an enemy starship. They win, thanks to the powers of their newest member, Carol Danvers, called Binary. However, the ship is damaged and Charles, though apparently healed up, won’t be going home right away. This gives him time to second-guess his choices aloud to Lilandra, the Shi’ar empress he loves, and to be reassured by her. It’s pretty obvious he won’t have much trouble finding something to do with his additional time aboard the Starjammer. Back at the mansion, Cannonball’s computer eats his term paper, the X-Men pair off for a game of baseball and, when Rogue goes airborne to retrieve Colossus’ home run, we get a cameo appearance from President Ronald Regan! Even Rogue loves the Gipper. Some guys have all the luck. After the game, Kitty goes back inside to grab a shower and overhears an argument from upstairs, in Storm’s loft, which she’s loaned to Scott and Maddie. We cut to the happy couple arguing over Scott’s commitment to the X-Men as opposed to his family. He feels that he needs to stay and lead the X-Men again, that they need him more than ever now that Charles is gone and Magneto’s running the school. Maddie, quite understandably, feels different. Their discussion is cut off by Storm, who’d been downstairs with Kitty. She offers a solution: she, though powerless, still desires leadership of the team, and is willing to duel Scott for the right–if he’s not chicken, of course. The X-Men kick the New Mutants out of the Danger Room and both teams huddle up in the control booth to watch what’s sure to be the fight of the year. And it is quite a tense affair, though in the end, Storm wins, stripping Scott of the visor he needs to control his powers. Scott is surprised and hurt, of course, but readers who’ve followed the last year or two of X-Men comics probably won’t be. Even powerless, Claremont has always written Ororo as a strong, powerful woman, wresting control of the Morlocks from Callisto in a knife fight and surviving the African desert with nothing more than her wits. And in Cyclops’ defense, becoming a new father is enough to distract any man! It’s worth noting, as well, how awesome and supportive Maddie is. She understood completely when he left her side when he heard of Charles’ illness, and even during the fight with Ororo, she’s concerned over the pain a loss would cause him, even though she wants him back with her instead of with the X-Men. It seriously underscores what a poor excuse for a man Cyclops is at this point, right up to the beginning of X-Factor this same year, when Jean comes back and he ditches Maddie and Nathan because Jean comes back from the dead. Ororo for the win! Eat it, Cyclops! Woooooo! The issue’s epilogue shows us Rachel Summers, visiting her grandparents’ home once more, to repair the holoempathic crystal broken two issues ago. She not only restores it to it’s previous condition, but adds her own imprint to the crystal, alongside Jean’s. She may not ever exist in this world thanks to the absence of Jean Grey, but she hopes that adding her essence to the crystal will keep her from ever being forgotten. One thing about this era of X-Men is how Claremont and the editors handling Uncanny didn’t wait for “big” issues to pull out all the stops. Issue #201 is at least as classic as #200, if not moreso (and so is #199, for that matter!). Next Issue: Phoenix vs the Beyonder! With BONUS Sentinels!